Cake tin: 8 inch (20cm) loose-bottomed round tin that’s at least 2 inches (5cm) deep. Place the biscuits in a flat-bottomed dish and crush into fine crumbs using the flat end of a rolling pin. Pour the melted butter onto the biscuits and mix together until all the butter and the crumbs are combined. Tip the butter and biscuit mixture into the cake tin and press down until you’ve formed an even base across the tin. 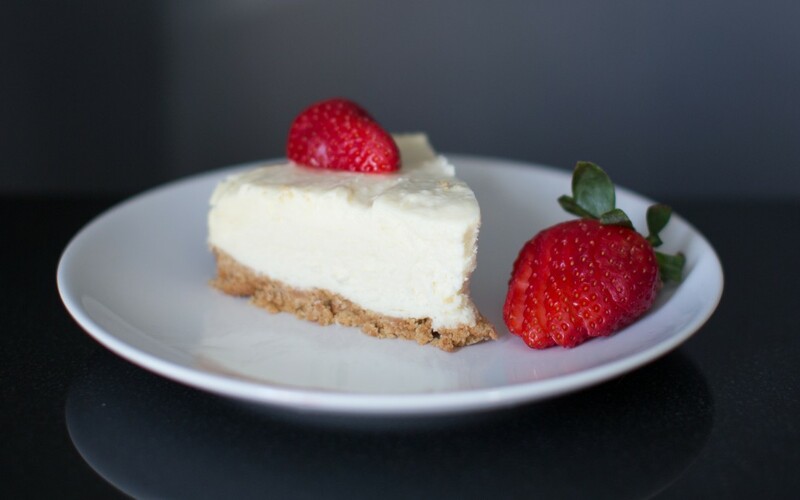 Put it in the fridge while you make the cheesecake filling. Place the mascarpone in a medium sized bowl. If you’re using amaretto, add it to the bowl of mascarpone and mix it all evenly together with a fork. If you’re not using amaretto, mash the mascarpone with a fork to soften it. In a medium sized bowl, break the white chocolate into individual pieces and carefully melt in the microwave. I find if I use three or four 20-second sessions on high power and stir well between each session, I can melt the chocolate without it going grainy but, again, it will vary depending on your microwave. In a large bowl, whip the cream until it’s at the soft peak stage. Add a large spoonful of whipped cream to the mascarpone mixture and gently fold in to loosen the mascarpone a bit more. Add the mascarpone mixture to the bowl of whipped cream along with the melted white chocolate, then gently fold the whole lot together until it’s evenly mixed. Retrieve the cake tin from the fridge and pour your mascarpone/cream/white chocolate mixture evenly over the biscuit base. Cover with clingfilm and return to the fridge to set for at least 2 hours. When you’re ready to serve, push the cheesecake out of the tin on the removable base, then cut the strawberries in half and arrange on top of the cheesecake. Enjoy!